1. Preheat the oven to 160°C, gas mark 3. Put a large, wide casserole over a medium heat. Season the chicken and dry-fry skin-side down for 10-15 minutes, until golden. 2. Remove the pan from the heat and lift the chicken out onto a plate. Add the onion to the casserole, season, and toss in the chicken fat. Top with the garlic, spices, lemon peel, olives, most of the herbs (use the stem ends here and reserve the leafy parts to garnish) and the squash. Dilute the stock pot in 400ml just-boiled water and pour over the top, then nestle in the chicken pieces, skin-side up. Cover (with a lid) and bake in the oven for 1 hour 45 minutes, until cooked thoroughly with no pink meat and the juices run clear. 3. Take out of the oven and rest, uncovered, for 20 minutes. At the same time, cook the couscous according to pack instructions. Fluff up with a fork then divide between 4 plates. Top with the tagine and sprinkle over the remaining herbs. 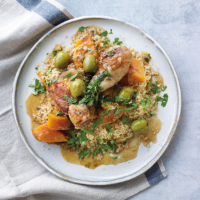 If you’re short on time, skip browning the chicken and bake everything (except the couscous) in the casserole.